One of the best story-driven games on PC, 80 Days is beautifully written, effortlessly charming, and thrillingly unpredictable. What is it? An interactive fiction game about exploring the world. You, Jean Passepartout, have come into the service of one Phileas Fogg, an English gentleman who has hired you to be his valet. But your duties go beyond trimming his moustache and starching his collar: you have to help your new master circumnavigate the world in just eighty days. Mon dieu! A hefty wager of £20,000 is riding on this expedition, not to mention Fogg’s reputation, but can it be done? 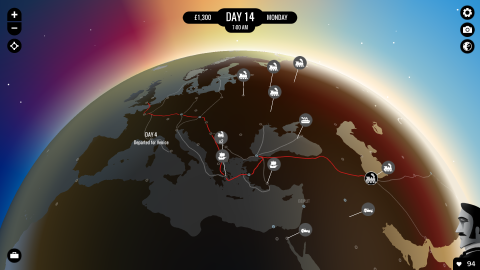 80 Days is a mostly text-based game. You plot your route across a 3D globe, and as you move between destinations, time passes and events pop up that you can intervene in by selecting certain actions or dialogue options. What makes it special are the sheer variety of outcomes and routes to take, and the quality of the writing, which is outstanding throughout. Like Jules Verne’s novel, the story takes place in the 1800s—but the game adds its own unique sci-fi twist. As well as trains, boats, and cars, you’ll travel in gyrocopters, hovercraft, airships, and other, stranger modes of transport that I’ll let you discover for yourself. It’s a stylish marriage of real history and science fiction, and the fantastical setting means you’re never quite sure what will happen next. Early on, while taking the train from London to Paris, it suddenly sprouts fins and plunges into the chilly depths of the English Channel. But amphibious locomotives are only the tip of the iceberg. Things get much weirder. You’ll encounter mechanical gondoliers in Venice, witness technological marvels at the World’s Fair, fly on giant mechanical birds, and see all manner of bizarre, wonderful things. The challenge lies in choosing the fastest, most efficient route across the world before the eighty days are up—but this is made difficult by several factors. The game systems in 80 Days are woven brilliantly into the narrative. Hotels and travel cost money, and managing your budget is a constant worry. Fogg’s health will suffer if a journey is too strenuous, affecting your ability to take certain routes. The train suddenly sprouts fins and plunges into the chilly depths of the English Channel. And misfortune befalls poor Passepartout on a regular basis. You’ll be robbed, thrown in jail, and accused of murder. Your airship will crash in the middle of the Pacific or you’ll anger a tribe on some remote island. There are countless ways to get into trouble, which can cost you money and time. But that’s all part of the fun. You probably won’t make the trip in eighty days the first time you play it, but you’ll still have amazing stories to tell. The deadline isn’t as important as the title suggests. Fogg is, initially, hard to like. He rarely speaks and seemingly shows no interest in the amazing things you encounter. He is completely unflappable; the quintessential English gentleman. But in certain perilous situations, you’ll see his human side emerge, briefly. There’s a remarkable amount of nuance in the game’s storytelling and characterisation. The people you meet are fascinating and richly painted, making it all the more devastating when you, inevitably, have to leave them behind. 80 Days can be funny, poignant, and bittersweet. It can be sad, scary, exciting, and sentimental. It all depends on the path you take and the choices you make. The story deals with issues like racism and colonialism far more intelligently than most games manage. Every trip is a whirlwind of emotions, and by the end you feel like you’ve gone on a personal, as well as a physical, journey. And because there are so many branching paths, it’s extremely replayable. I’ve gone around the world seven times now, and every journey has felt like a new experience. Every time you complete a circumnavigation, additional stories and events unlock, giving you even more incentive to try again. It’s also brilliantly accessible and easy to play, making it the perfect game to share with someone who never, or rarely, plays them. But that doesn’t mean it’s a walk in the park: getting around the world in eighty days (without using a certain shortcut) is a real challenge. Passepartout is the real star of 80 Days. It’s the story of a modest valet from France becoming an experienced man of the world, and sharing that with him is an absolute joy. There are genuinely touching, heartfelt moments—and some terrifying ones—all brought to life by exquisite, artful prose. It really feels like an adventure, voyaging into the unknown, wondering what marvel or danger lies around the next corner.